Happy Monday Everyone! Hope you had a great few weeks. I enjoyed my blog break, but nothing exciting happened. Just been working and working on swim team activities. We’ve already had a successful cleaning the pool area day, picnic organizational meeting, and bonfire team bonding event. This is going to be a super busy week with an 8 team relay, a sleepover, and working concessions at a U of M game. Once we get through this, the work will slow down until the end of season as we’re only hosting 5 meets. Yay! I did get some reading in these past few weeks. 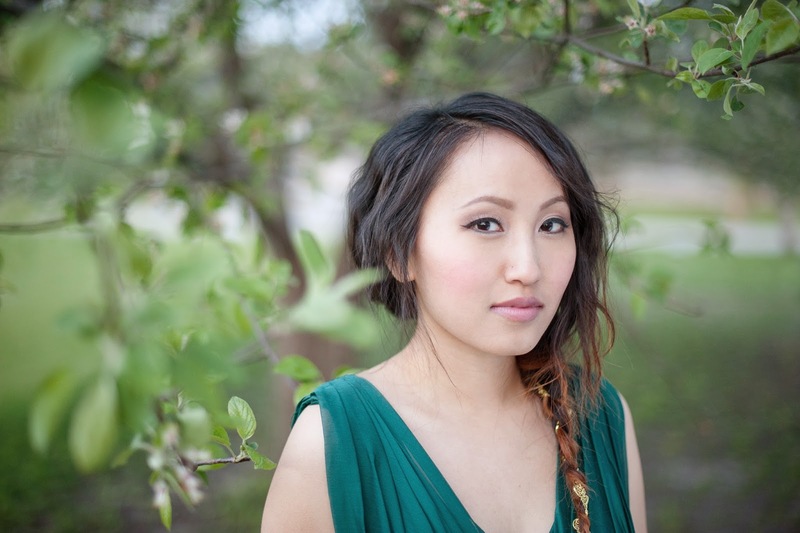 Julie Musil just released her new YA contemporary novel THE SUMMER OF CROSSING LINES. Here’s a blurb: When her protective older brother disappears, sixteen-year-old Melody infiltrates a theft ring, gathers clues about his secret life, and falls for a handsome pickpocket. At what point does truth justify the crime? The winner of GATES OF THREAD AND STONE is Emma A! The winner of COPPER MAGIC is Reader Noir! And the winner of my Beach Reads Giveaway Hop is Shannon R who chose the $10 Amazon Gift Card! Congrats! E-mail me your address so I can send you your books. Please e-mail me by the end of Wednesday or I’ll have to pick another winner. Today I have a fantastic guest post by Holly Schindler, who writes in both MG and YA stories, and a giveaway of FERAL, her new YA novel. Details about the giveaway will be at the end of the post. So here’s Holly! recovering from violence. FERAL also includes some pretty brutal passages—especially in the opening chapters. In fact, those who have managed to get their hands on an advance reading copy might be surprised to learn that the book started out as an MG. In the MG version, the book was a straight mystery (rather than a psychological thriller) about a young girl trying to get to the bottom of a cold case that centered on the death of a former student at her middle school. But during the revision process, the book got increasingly darker—and I began to suspect it was growing too gritty for the MG category, that it might need to be a YA instead. You’d think that bumping a book up in age would be a fairly simple process: you’d keep your characters but age them, and would also hang on to the original genre / subgenre. You’d think it’d be a process of trading out bicycles and giving characters cars. Making the dialogue a bit older. But I found that bumping a book from the MG category into YA involved far more than that. It was a real overhaul. 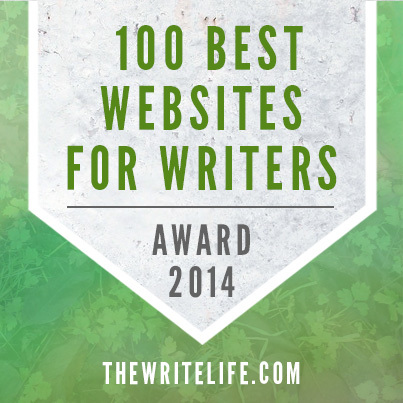 So how can you know if your own book really should be bumped up in category? I’d argue the decision centers on three components: Character, Theme, and Genre. • Character: We’re not the same people at seventeen that we were at thirteen. I discovered that the MG character I’d created didn’t belong in my YA at ALL. I actually needed a new protagonist that fit with the grittier surroundings. You may feel, as I did, that brainstorming a new character is somewhat freeing. That it’s bringing you closer to what your book really needs to be. 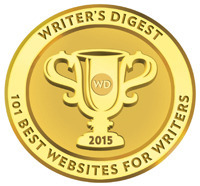 You may also feel that you’re losing something vital (voice, perspective) to your novel. If that’s the case, it may be an indication that you need to keep your book in the MG category. • Theme: As I brainstormed a character sketch for my new protagonist, I discovered a pretty chilling backstory: Claire had survived a brutal gang beating in her hometown of Chicago. When I had that backstory, I knew I also had a theme for the book that meshed with the dark, gritty YA I was also creating: I knew the book needed to be about recovering from violence. That’s a theme that might not make it into the MG category—at least, not in the way I was beginning to imagine it. Yet another indication that turning my book into a YA was moving in the right direction. • Genre / Subgenre: Once I knew who my protagonist was and had nailed down the overall theme, I also knew the genre needed to change. Rather than a straight mystery, I knew FERAL needed to be a psychological thriller. That format was going to allow me to focus my attention on the “psychological”—the inner workings of my main character—while exploring, in brutal detail, the terrifying aspect of recovering from violence. Some genres just lend themselves more to YA (for example, romance). I felt that the psychological thriller also lent itself better to the YA readership. I’ve learned to be open to literally anything as I plunge into revision. I have to let my book talk to me, tell me what it wants to be. I’m certainly glad I listened to my book and pushed it into the YA world. For you, listening to your own book may mean bumping your WIP up into another age group—but it also may mean listening to your book tell you that the revisions should continue to take place within the MG category. After all, being open to any possibility means being open to the possibility that your first instincts were right all along! Holly has generously offered a copy of FERAL for a giveaway. To enter, all you need to do is be a follower (just click the follow button if you’re not a follower) and leave a comment through September 6th. I’ll announce the winner on September 8th. If your e-mail is not on your Google Profile, please leave it in the comments. If you mention this contest on Twitter, Facebook, or your blog, mention this in the comments and I'll give you an extra entry. You must be 13 or older to enter. This is for US and Canada only. On Wednesday, September 3rd, I have a guest post by debut author Kerry Cerra and a giveaway of JUST A DROP OF WATER, her MG contemporary. The following Monday I have an interview with debut author Stephanie Gaither and a giveaway of FALLS THE SHADOW, a YA futurist story about cloning replacement kids. I was hooked in the first few pages. The following Monday I have a guest post by PJ Hoover and a giveaway of TUT, her YA story with mythological themes. I’m a huge fan of PJ’s and am excited to see how her books have been both traditionally published and self-published. Wednesday that week I have a guest post by long time follower and debut author Joshua Bellin with a giveaway of SURVIVAL COLONY NINE, a YA sci-fi story. And don’t forget Casey’s Thursday Agent Spotlights. Hope to see you on Wednesday, September 2nd! Hi All! 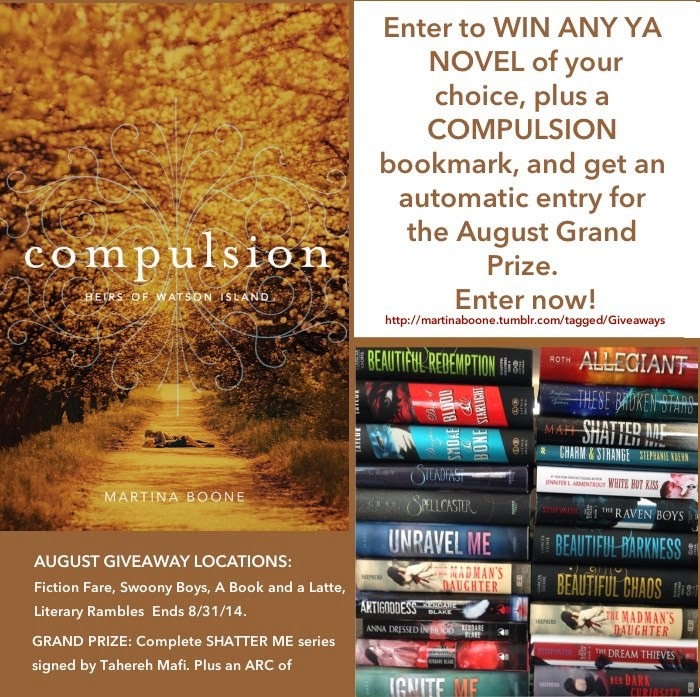 I'm so happy to help Martina Boone celebrate the upcoming release of her YA southern gothic romance COMPULSION that releases October 28, 2014. And I'll be having Martina back with another giveaway when her book releases. All her life, Barrie Watson had been a virtual prisoner in the house where she lived with her shut-in mother. When her mother dies, Barrie promises to put some mileage on her stiletto heels. But she finds a new kind of prison at her aunt’s South Carolina plantation instead--a prison guarded by an ancient spirit who long ago cursed one of the three founding families of Watson Island and gave the others magical gifts that became compulsions. And here's some info on Martina. If you don't follow her blog, I highly recommend it. 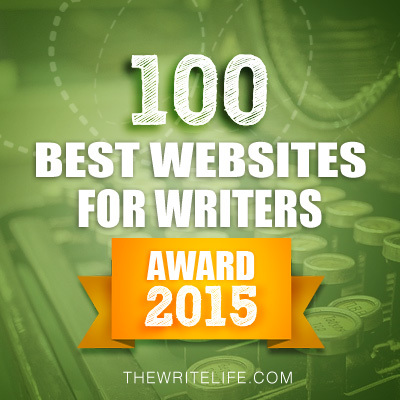 She does a ton of awesome giveaways and contests to help writers. 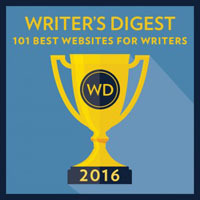 Martina Boone is the founder of AdventuresInYAPublishing.com a two-time Writer’s Digest 101 Best Websites for Writers site. 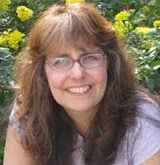 She is also a founding member of YASeriesInsiders.com and the First Five Pages Workshop When she isn’t writing, she loves to ski, ride dressage horses, travel, and read beautiful, slightly-twisted fiction. She eats Nutella on pretty much anything, adores marzipan, has guilty cravings for stale sugar-free licorice, drinks chocolate-flavored tea with milk, and watches Doctor Who, Chicago Fire, Nashville, Suits, Top Gear, So You Think You Can Dance, Hart of Dixie, Vampire Diaries, Walking Dead, Game of Thrones, Grey’s Anatomy, and Downton Abbey. She’s on the fence about The Blacklist, and she’s so, so done with Scandal. You can find her on her website or on Twitter as @MartinaABoone. I’m taking a blog break for two weeks until Monday, August 25th when I have a guest post by Holly Schindler and a giveaway of FERAL, her new YA psychological thriller. Then I'll be back in September with a great line up of debut author interviews and giveaways. Hope to see you on August 25th! Happy Monday Everyone! Can you believe it's August? For me, it means swim season is starting and this is probably going to be one of the busiest months. We've got pool pride day, our annual informational picnic, two bonding events, a 8 team relay we host, and a U of M concession working day. And of course the girls start swim practice soon. It'll be fun and will feel good to have accomplished it all. First I have a winner to announce. The winner of EXTRACTION is Gina Gao! Today I’m thrilled to have debut author Lori Lee here to share about her YA fantasy GATES OF THREAD AND STONE that releases tomorrow. I’ve been waiting for this for ages and it was worth it. The world building is fantastic and I loved Kai’s power to manipulate time. Hi Lori! Happy Release Day Tomorrow! I sort of equate reading with my intellectual “awakening” lol. And by that I mean I had really terrible grades and trouble understanding school lessons until I discovered a love for reading in second grade. That might not seem like a big deal since it was only second grade, but it might make more sense to know I flunked kindergarten. To be fair, I was three years old when my family relocated to the US, and I probably wasn’t the greatest English speaker yet by the time they put me in school. Once I discovered how much I loved books and reading, however, everything changed. I began writing in third grade during an after school program, and I haven’t stopped since. I wrote tons of short stories and my first (terrible) book between fifth and seventh grade, totally made up the “essay” about my grandmother in high school, and exchanged notebooks with my friends, filling the pages with letters and thoughts and stories. 2. Awesome how writing changed your life. Where did you get the idea for your story? Kai developed out of something a writing friend said in passing about time. That, combined with my fascination of mind-controlled super soldiers, was the spark for the plot of Gates of Thread and Stone. 3. I loved the world building and the fact that we get to see more than the world Kai grew up in. Share about your world building process and some of the questions we need to ask ourselves when creating our new worlds. driving over a bridge and it was so foggy that I couldn’t see the other end. It simply disappeared into the mist. And perched on top of every lamp post on either side of the bridge was a single seagull. This became the spark of an idea that led to one of my favorite places in the book. When world building, an important thing to focus on is your world’s history, even if most of it never makes it into the book. Your world’s back story is just as important as your characters’, and it’s something I almost always think about first when approaching a new book. Kai lives in the Labyrinth, the worst part of the city, but how did it become that way? Why and how did the Labyrinth form? In what world would such a place exist? These things might not be relevant to the plot, but they’re important to making your world more dimensional. 4. So cool how your world building came in part from every day life. And the questions you share to ask ourselves are really good ones to consider. I read you are a total outliner and can write a 50 page outline. That’s pretty detailed. What was the outline process like for GATES OF THREAD AND STONE and how long did it take to write your first draft? I made a document for character profiles, a document for world building details, and a document with the overall story structure (e.g. Act I, II, turning point, Act III, climax, etc). Then there was the actual detailed outline, which was 24 pages long. Just preparing to write the book took some time. But once I sat down and began writing, I finished the first draft within four weeks. 5. I wish I could outline like you because maybe then I’d be able to write my first draft quicker. Kai is such a loyal, one-pointed character. Share a bit about her and any struggles you had in developing her as a character. Like I told a friend recently, Kai has “crazy loyalty issues.” She doesn’t trust easily, but when she does choose to trust someone, she does so implicitly. Loyalty is an admirable quality, but it becomes problematic when it blinds you to the truth. I didn’t have any particular struggles developing her because much of her internal conflict and growth reflects external events, so it happened naturally. 6. Your agent is Suzie Townsend, who sounds like a fantastic agent. How did she become your agent and what was your road to publication like? Suzie is a rock star. She had sent me the most awesome rejection + notes on a previous manuscript, so she was already familiar with my work when my second manuscript came to her attention. That’s why it’s so important not to burn your bridges. A rejection on one book might turn into an acceptance on the next. 7. Yes, I’d love to have her as my agent. 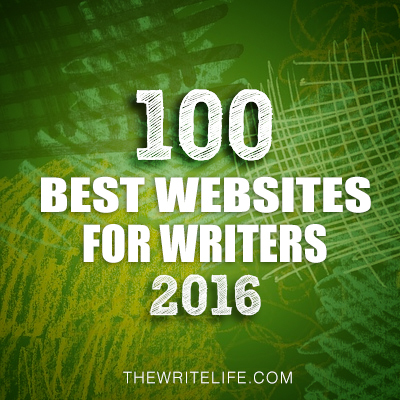 I saw on your website that you’ve already been interviewed a number of times on other blogs. How did these come about and what other plans do you have to spread the word about your book? A couple of those interviews I sought out on my own, but most of them happened simply because they asked to interview/feature me, which was lovely. My publisher is doing a number of things, but I’m also doing what I can to get into libraries and schools. I’m not having an official blog tour, but the blogging community is wonderful so we’re doing some blogger outreach as well. 8. Getting into libraries and schools is a big key in getting the word out about your book. Share something that’s surprised you in the time from signing your publishing contract to reaching publication release day. It’s not so much a surprising thing as it is just frustrating—which is that SO MUCH is out of my control. Deadlines and covers and marketing and ARCs. So many things to stress over, but I’ve learned that the best use of my time is simply to work on that next book. 9. That is one of the most frustrating things about this profession. What are you working on now? 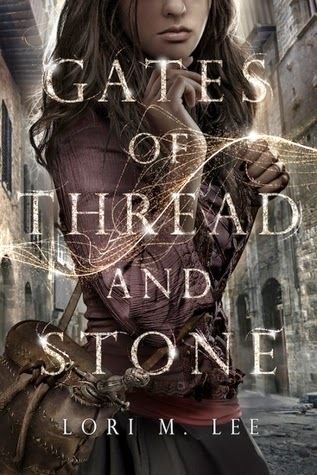 Lori has generously offered a copy of GATES OF THREAD AND STONE for a giveaway. To enter, all you need to do is be a follower (just click the follow button if you’re not a follower) and leave a comment through August 23rd. I’ll announce the winner on August 25th. If your e-mail is not on your Google Profile, please leave it in the comments. If you mention this contest on Twitter, Facebook, or your blog, mention this in the comments and I'll give you an extra entry. You must be 13 or older to enter. This is an International giveaway as long as you live where The Book Depository ships for free. 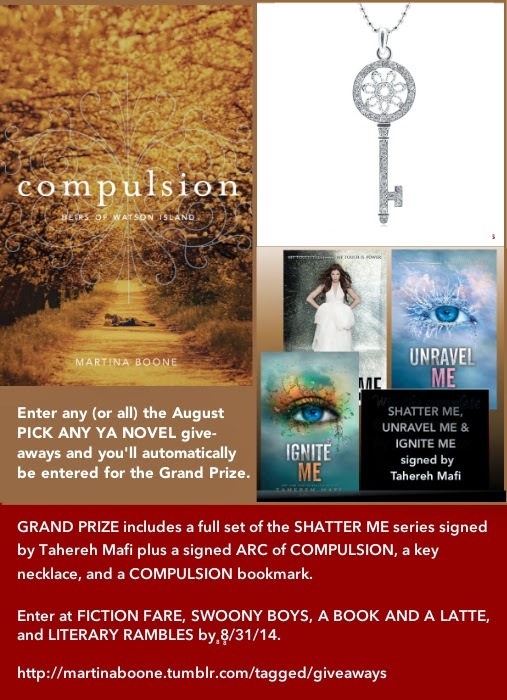 On Wednesday I'm hosting a pick any YA book giveaway to help Martina Boone celebrate the release of her YA debut COMPULSION in October. Then I’m taking a blog break for two weeks until Monday, August 25th when I have a guest post by Holly Schindler and a giveaway of FERAL, her new YA psychological thriller.